You know the saying, when life gives you lemons, make lemonade? Well, we decided to apply that to dandelions last week! It all started when we walked outside to see a sea of dandelion blooms dotting our grass with happy, yellow splotches. It brought to mind my friend Heather’s brilliant easier-than-weeding plan to arrest the spread of the dandelions in her yard. She hired her four boys to pick them, paying them per flower. My father arrived soon after and, learning of the kids’ mission, mentioned that we should use the dandelion flowers to make soup! He had tried a dandelion soup while living in China and liked it. We had used dandelion greens in salads before, but I had a long list of to-dos that day and making dandelion soup was not high on it. Yes, I know, my father’s words can be well worth listening to, but I tried not to this time. 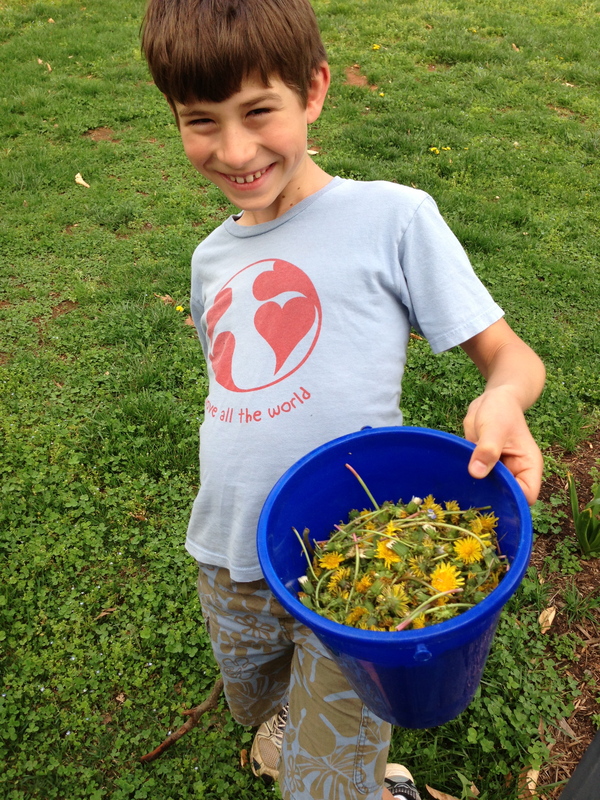 By the third time he brought it up, the kids had amassed enormous piles of dandelions in their pails which my father estimated was going to cost me $9 a pail! Even the kids were shocked at how many they had picked in such a short time! Thankfully, my tender saplings cut me a deal and the whole lot came out to $9 instead of $18. Love their generosity! About then, I took the soup idea seriously and googled it. 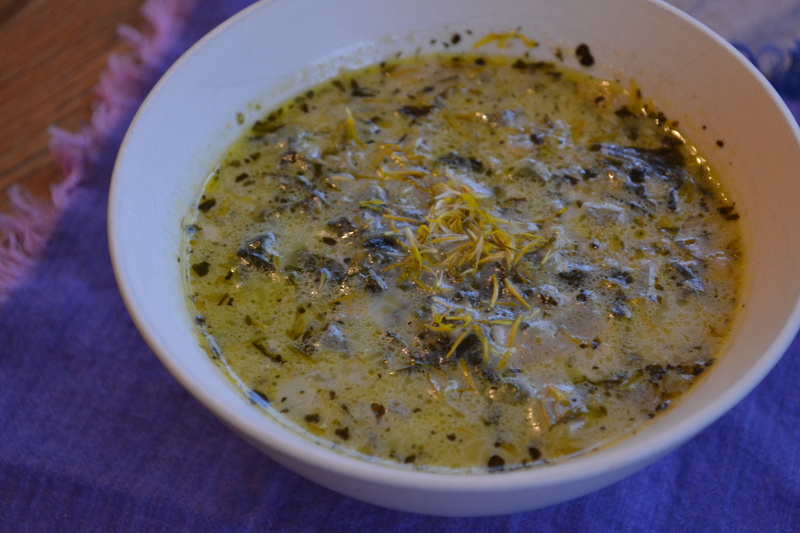 There were no Chinese recipes in the top ten, but this cream of dandelion soup recipe from Nature’s Nurture came up and I decided to give it a go. I liked how the recipe made use of the leaves too. We pretty much followed the recipe as written, but did not use any buds in our soup. 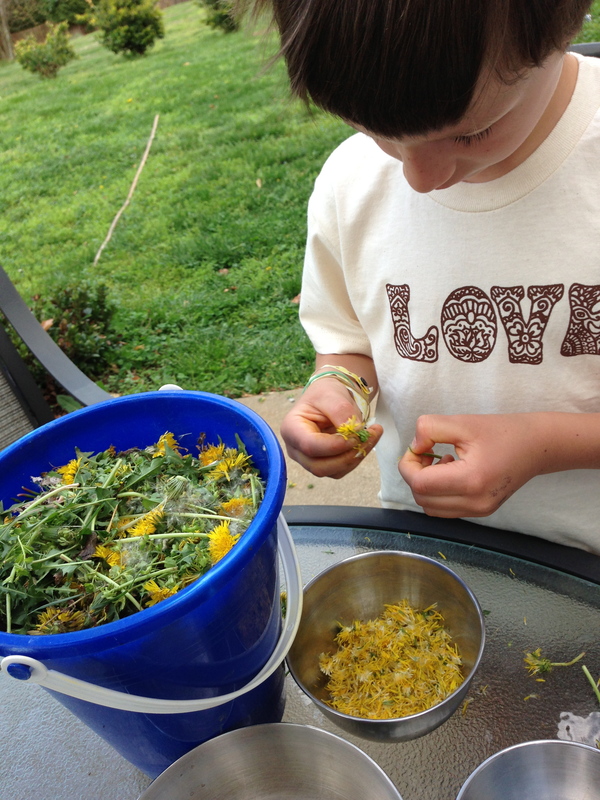 Separating dandelion petals to make soup. 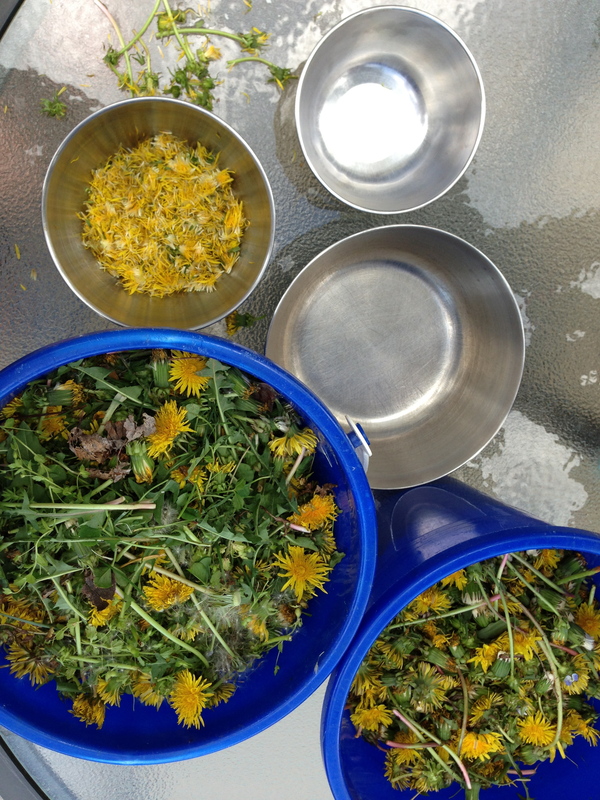 Once we had enough petals and leaves stripped of grass and ready to wash, we set to work making the soup. It smelled so good, looked lovely, and tasted delightful! The younger two wouldn’t even try it. You know how they say some people need to try certain foods fifteen times before they like the taste? We’re thinking of serving the kids dandelion soup a few more times to see if it will take. Why not? The next morning we all woke up to another beautiful sea of golden dandelions decorating our yard, though apparently 1,800 fewer than there might have been. What spring recipes do you love? Is there anything special you do to celebrate May Day? 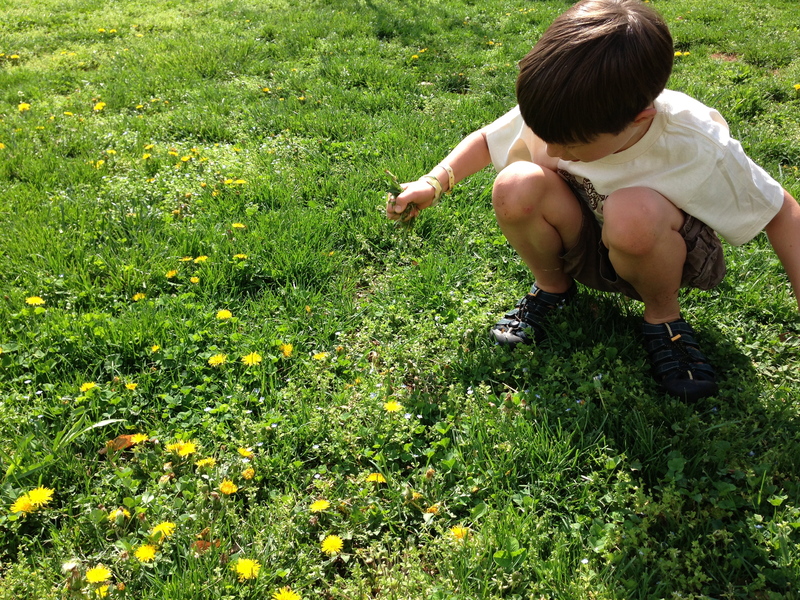 Patience, Persistence, Perseverance, and Determination (= lots of hard work) to collect all those dandelions. Politeness and Courage to try the soup. What else do you see as virtues that the dandelion picking and soup-eating cultivate? Joy? The kids seemed to enjoy plucking flowers off the dandelion stems. Honesty/Truthfulness? Our oldest was very articulate about liking the taste but not the concept of the soup. Others? Categories: Have Fun, Sustainability, Virtues | Tags: creamy soup, dandelion, dandelion soup, foraging, May Day, recipe | Permalink. Emily is homeschooling mama to three amazing boys, whose alarming growth and appetites keep her running laps to the grocery store. She writes about loving life amidst the piles of laundry and legos. When life is just too much, she binges on chocolate and plans a dream trip around the world. I think it looks delicious, but I can appreciate Liam’s comment that his brain “would not accept me eating flower petals.” I can relate to that!!! By the way, that was a LOT of dandelions!!!!! Gratitude Giveaway – What Are You Thankful For? Grab our Global Kids Gift Guide button to add to your site!